SECURITY & PRIVACY. Online orders are encrypted and processed on Paypal's secure server. You don't need a PayPal account to purchase from our store. We accept all major credit cards and deliver to nearly 60 countries. We refuse to share your private data with third parties. EXCHANGE RATES, PAYING FOR YOUR ORDER . All orders are processed in $US dollars. If you pay with a credit card using a different currency, your payment will be converted automatically into US dollars at the prevailing daily rate used by Paypal. When you view your credit card statement, the purchase will be listed as PAYPAL (BUDDHIST ART). DELIVERY AND PACKAGING. Delivery from four to eight weeks. Most statues are made to order (we hold a very small inventory), and it typically takes four to six weeks to carve the statues. So please be patient. If we anticipate longer delivery times, we will contact you and give you the chance to proceed with the order or to cancel it for a full refund, minus a small handling fee of approx. $3 or $4 US dollars. All orders ship in sturdy boxes with protective air-bubble cushioning. Orders ship via insured International Express Mail (about $20 per order). The product price plus the shipping cost are then taxed at a rate of 5% (in accordance with Japanese law). INVOICING & BILLING. After placing your order, you will receive an email receipt. Also, our artwork ships with a printed invoice listing all fees, shipping & handling costs, and taxes. In accordance with Japanese law, all products (plus shipping & handling) are taxed at a flat 5% rate. MONEY-BACK GUARANTEE, REFUNDS. We believe fully in the quality of our handmade products. We also carefully inspect each piece for quality and artistic merit prior to shipping. We offer a 15-day money-back guarantee on all our products. If you are unhappy with your product, you may return it to us, within 15 days of receipt, and we will refund your money (excluding shipping, tax, and a small $3 handling fee). The buyer is responsible for the cost of return shipping. This guarantee is void if the buyer has altered, stained, or soiled the product. WHAT IF MY PRODUCT ARRIVES DAMAGED? If you are present when the statue is delivered, and can see physical damage to the package (even without opening it), you can either (1) refuse the package and tell the delivery service to return it to us; or (2) open the package in front of the delivery person, confirm if it is damaged or not, and refuse delivery if damaged. If you are not present when the package arrives, but discover damage upon opening it, please contact us as soon as possible. You have the option of receiving a refund or exchanging the product for another of the same kind. But please contact us before returning the product. CANCELLATION POLICY. For customized orders, the buyer can cancel the order if the carving of the statue has not yet begun. For statues in our inventory, the buyer can cancel the order if the statue has not yet been shipped to the customer. Please contact us if you wish to cancel your order. Refunds for canceled orders are equivalent to the net sale price (minus shipping, tax, and including a small $3 handling fee). LOCAL CUSTOM DUTIES AND TAXES. The customer is responsible for paying any additional custom duties or taxes in their nation of residence. We have no control over this. But in most nations, if the package is valued at $200 or less, it arrives directly to your door with no added costs. DEITIES AND STYLES. 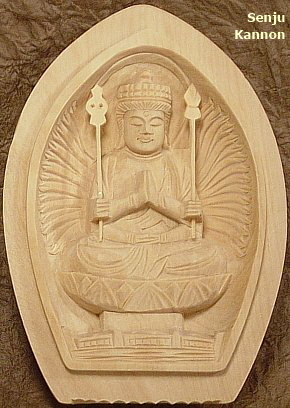 Our regular lineup of hand-carved Buddhist deities are based on templates and standardized styles. Nonetheless, each statue is unique, for the very nature of handicraft production means that slight variations will occur in every carving. Thus, the statue you order will not look "exactly" like the photo in our estore. We inspect all pieces for artistic merit and quality before shipping to the customer, and refuse to sell inferior carvings. We handle numerous Buddhist deities (see column at left), and offer most deities in two or three different styles. Our mainstay styles are shown below. ICONOGRAPHY AND ARTISANS. Our regular offerings are hand-carved both in China and Japan, but most are crafted by master artisans in China, a nation that has enormously influenced the development of Buddhist art and faith in Japan. Even so, Japan's artistic sensibilities are different from those of China, and we have commissioned the carving of our statues for the Japanese market. Thus, the iconography of our regular lineup closely reflects the Buddhist artistic traditions of the Japanese, not the Chinese. Details about each item are presented on the product pages, so you always know what you are buying. Finally, we occasionally find wonderful statues at flea markets in Japan, China, and Southeast Asia. These latter statues are offered in the Flea Market section. They are not based on template designs, nor offered again once sold. CUSTOMIZE YOUR ORDER. If you cannot find the Buddhist statue you desire in our eStore, but would like to inquire about its availability, please ask. We can either locate or commission the carving of the statue. Please bear in mind that such statues typically cost more than our regular offerings. We will inform you of statue availability, time required, size options, wood options, and pricing. You will be given the opportunity to proceed with your customized order or to decline our offer. Please be patient. It may take one or two weeks before we can determine product availability for customized orders. To contact us with customization inquiries, click here.